We are committed to a world that celebrates diverse voices, and encourages everyone to tell their stories. In 2017, 972 volunteer Municipal Liaisons supported 468,104 participants on six continents. You are capable of even more than you think. We are committed to building writing confidence. In past surveys, 86% of respondents said that NaNoWriMo helped them learn what they can accomplish when determined. 89% of respondents said that NaNoWriMo made them more excited about writing. In a past independent study, 87% of student participants in our Young Writers Program said that it made them more confident writers. Download our Young Writers Program informational packet. We are committed to creating real-life, vibrant, literate communities. Every year, we partner hundreds of volunteers with their local libraries, bookstores, and community centers. See more of NaNoWriMo’s numbers. NaNoWriMo’s 2017 Annual Report: View or download on Scribd. NaNoWriMo’s 2016 Annual Report: View or download on Scribd. NaNoWriMo’s 2015 Annual Report: View or download on Scribd. NaNoWriMo’s 2014 Annual Report: Download as a PDF. 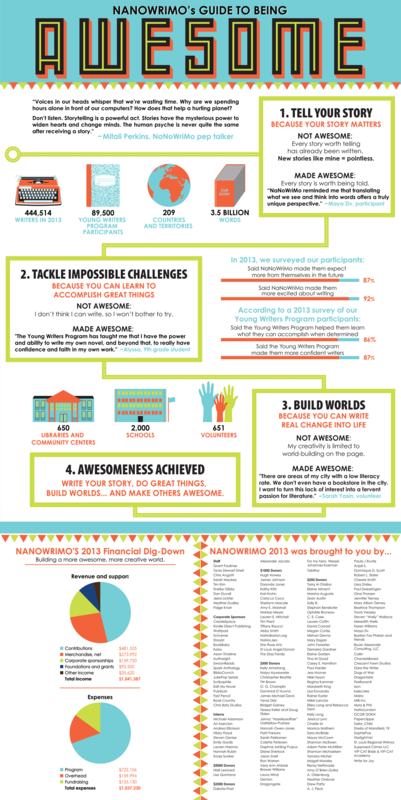 NaNoWriMo’s 2013 Annual Report: Download as a PNG. NaNoWriMo’s 2012 Annual Report: Download as a PDF. “I partook in NaNoWriMo for the first time in 2017 and loved it because of the challenge. There were times when I just wanted to cry due to frustration because I didn’t meet my set goal for the day. There were times when I actually got inspiration at 3 AM. Gosh! My head was spinning with ideas throughout November. All in all, NaNoWriMo 2017 was a great one and I enjoyed reading other peoples’ ideas about their works. I also got a few tips on how to improve as a reader and overcome writers block. Thanks! “The Young Writers Program has given [my students] the opportunity to prove that the scribbling they were doing in their notebooks wasn’t a waste of time. They wanted to show the world that the stories inside their heads had value. They proved that they don’t need to have all the answers to write a book, they just need to have the right questions, so that the rest of us, together, can find a resolution. Aside from the writing itself, students were happy to meet peers with similar interests, and the organized structure of the event motivated them to write regularly and even exceed their goal. Did writing your novel get you through dark days? Did you meet your true love at a write-in? Did you just have a regular, straight-up blast writing this November? Tell us your NaNoWriMo testimonial!